The detained blogger was mentally and physically abused in Al-Khalifa police station, while being transferred to prison. He was beaten up by sticks and his body was standing in a harmful posture for long hours. 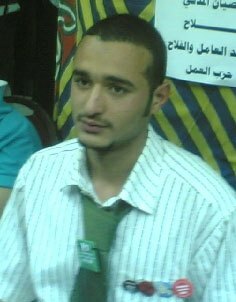 A report was submitted to the Egyptian General Prosecutor claiming that the detained blogger Ahmed Abou Doma was subjected to torture. Ahmed Abou Doma runs a blog called Sha’er ikhwan (Ikwani Poet), where he writes his poems and texts, expressing his political views. He published on this blog the photos he took in Gaza during the visit, which lead him to jail. After his arrest, the blog has been updated by his friends. A letter sent by Doma short after the sentence is also available on the blog (Arabic).